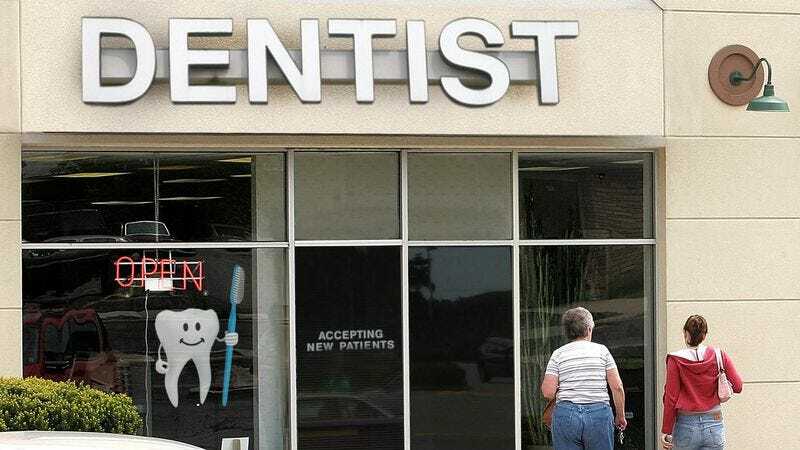 GREENEVILLE, TN—A cartoon image of a giant tooth smiling and holding a toothbrush in the window of Dr. Howard Goldenthal’s office inspires nothing but total, unqualified confidence in his abilities, local patients of the oral surgeon confirmed Tuesday. “I was initially pretty nervous about getting my wisdom teeth out, but after seeing a sign on Dr. Goldenthal’s office featuring an anthropomorphic tooth waving a big toothbrush in one hand and giving a thumbs up with the other, I realized my concerns were both unfounded and ridiculous,” said 24-year-old Dennis Kierstead, adding that the fact that the tooth is happy and clean-looking is, in itself, proof positive that Dr. Goldenthal is a trained medical professional of the highest stature. “I looked into the tooth’s big, round, googly eyes and immediately thought, ‘What am I worried about? This is clearly an establishment of unblemished excellence, and I have no problem with this dentist anaesthetizing me and sticking sharp metal instruments into my mouth.’” Kierstead also confirmed he was put even more at ease after seeing the name of the establishment was Dependable Dental.